Download the robust package for all the details on the making, methodology, and management of our multifaceted Social and Emotional Learning measurement tool and start planning your students' success. Weigh the evidence yourself—see the reports, read the research, and review the theory of action. The snapshot overview of the assessment system that doubles as a printable brochure to share with your colleagues. A sample student report of how assessment results are explained and shared with middle and high school students, in the actual format they receive. A thorough sampling of the assessment items for each of the three assessment methodologies (self-report, situational judgment test, and forced-choice) and visuals of how the items appear to students during the assessment. The comprehensive theory of action that demonstrates how the assessment works in schools today as well as the scientific research and logic upon which the system was built. 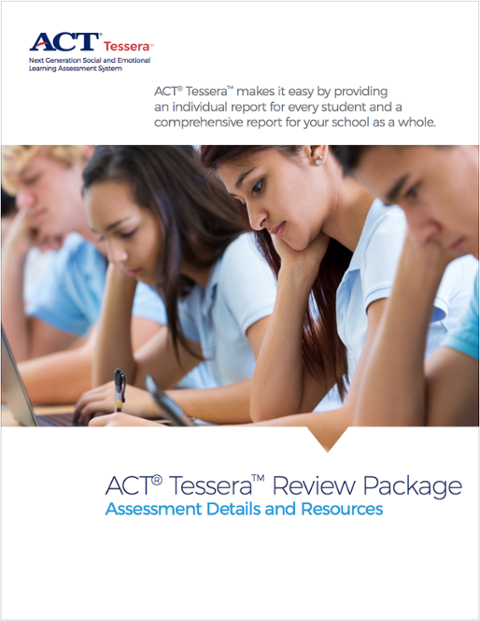 Download the ACT® Tessera™ Review Package now and start your self-guided tour of the assessment at your own pace. The better you understand your students’ soft skills today, the better you can help them succeed tomorrow.